Spotted this weekend on the Upper East Side, these two Manhattanites are exhibiting exactly how not to use duct tape. 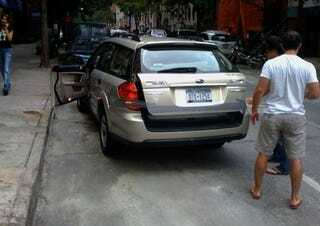 Silly New Yorkers, everyone knows you go top to bottom, not left to right when duct-taping a ZipCar liftgate shut. See more automotive fail here.